I’m a Doctor Who fan, but I will admit that the timey-wimey stuff often gets me confused. I loved time-travel stories but I’m usually left scratching my head at the end because I just can’t make it work the linear way my mind wants me to. This feeling, this confusion, is what I had at the end of Keise Laymon’s debut novel. This is not a reflection on him as a writer, but everything on me as the reader. 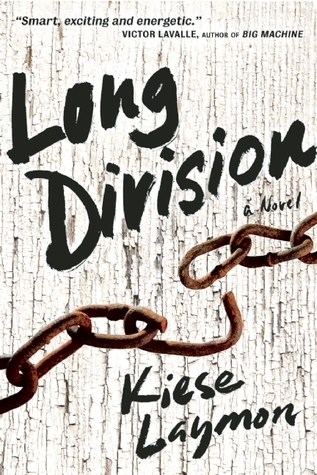 Moving on, Long Division is a novel about teenagers making sense of the racial inequalities in their world, as well as learning to be responsible for one’s actions, both positive and negative. Because it is a novel with time travel in it, the reader experiences life in 1964, 1985, and 2013. Making each of these time periods distinct, and the characters interactions during each of the time periods, is what Laymon does best. For example, I was a tween in 1985, therefore a number of the references 1985 City makes, how he speaks, is very true to the time period. Conversely, 2013 City reads just like one of my students. Laymon does a good job capturing the myriad of thoughts teenagers will have in a given moment. This oftentimes led to some hilarious inner monologues and exchanges from both of the young men. Both 1985 City’s and 2013 City’s section are given to the reader in first person, so we are privy to the boys mixture of deep and mundane thoughts. And just like regular teens, these thoughts can go from deep to mundane in the blink of an eye. It was usually at those moments that I laughed the most. The novel takes place over a series of days, but both 1985 City and 2013 City make the transition from boys to men in that short period of time, coming to understand the complexity of the effects of one’s decision and how it can have a lasting impact. I won’t give it away, but there is a moment towards the end where 1985 City has to make a decision that no adult would want, but he handles it with a maturity and grace that is absolutely beautiful. Lastly, Long Division is not a novel where you can sit back and relax. You have to pay attention; notice the social commentary that Laymon drops subtly all throughout the novel. It is a very different type of Young Adult novel, but is one that teens are capable of finding, discussing, and examining the deeper meanings behind the words presented on the page. It is a novel that respects the teenage mind, while challenging them at the same time.